As we near the end of the quarter I’ve begun to hear quite a bit about the “end-of-quarter markup” phenomenon. I’ve also received a few questions about it. The theory is that mutual funds and other large institutions tend to “mark up” the prices of securities at the end of each quarter so that their return numbers look better. I decided to take a look. First I ran a test which showed the return of the S&P 500 on the last day of each quarter going back to 1960. Of the 186 quarter-ends over the period, 90 have had a positive last day of quarter, 94 finished negative, and 2 were basically dead even. The average win was 0.065%. The average loss was 0.06%. The net average day was 0.001%. Not even as good as an average day over the period. I then checked to see what happened if the market sold off the few days leading up to the last day of the quarter (like now). For instance, 7 times the market sold off at least 2.5% in the last 3 days of the month. Five saw gains on the last day and two saw more losses. Unfortunately, the losses nearly eclipsed the gains. Lowering the requirement to a 1.5% selloff in the preceding 3 days gave 18 trades. 9 winners and 9 losers. Net expectancy was slightly negative. I then looked at what happened if the S&P was down at least 3 days in a row just before the last day of the quarter. Twenty occurrences. 10 winners. 10 losers. Slight negative expectancy. Looking at recent history rather than all the way back to 1960 did not help these studies. No matter how I looked I was not able to find any evidence of an end of quarter mark-up in the index. Perhaps mark-ups occur in individual securities, but it’s not apparent in the general market. Would you like to explore these studies more? Or customize them with your own ideas? Quantifiable Edges studies are now available for purchase in Tradestation format along with pre-set workspaces. Click here for more details and a complete list of available studies. Click the buy now button below to download and install directly to Tradestation. The market has now sold off for two straight days. Of some concern is that I’m not seeing evidence that anything is overdone to the downside. For example, I looked at all stocks in the S&P 100 tonight along with my list of 115 highly liquid ETF’s that I track. None of them made a 10-day low on Thursday. None. Breadth is not suggesting we are due for a bounce. Price-wise we are back to the middle of the recent range. I have very little to add tonight so I thought I’d do a quick review of outstanding studies. Earlier this week there were several bearish studies which had short-term influence. That influence is beginning to dissipate. Those studies may be found here and here. Prior to these I had posted several bullish studies with intermediate to long-term influence. Each night in the Subscriber Letter I list all outstanding studies, their time frame and their bias. I find it a useful graphic for helping me organize my thoughts and determine my own trading bias. The bullish intermediate-term studies I consider active are listed below along with the time-frame they looked at. In reviewing them you may notice that many are just beginning to reach their sweet spot. While the pullback may or may not have farther to fall I am not seeing evidence at this point that it will be anything more than a pullback. The Capitulative Breadth Indicator (CBI) returned to “zero” yesterday, finally closing out the last of the recent trade cluster. 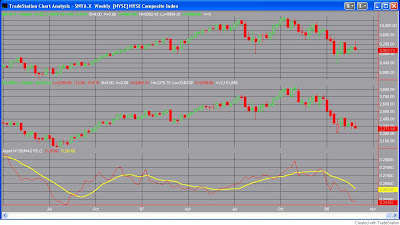 Below is an updated chart of the index. The “buy” and “sell” arrows on the chart once again show the results if one was to buy the S&P any time the CBI hit 10 and then sell it when it closed at 3 or below. 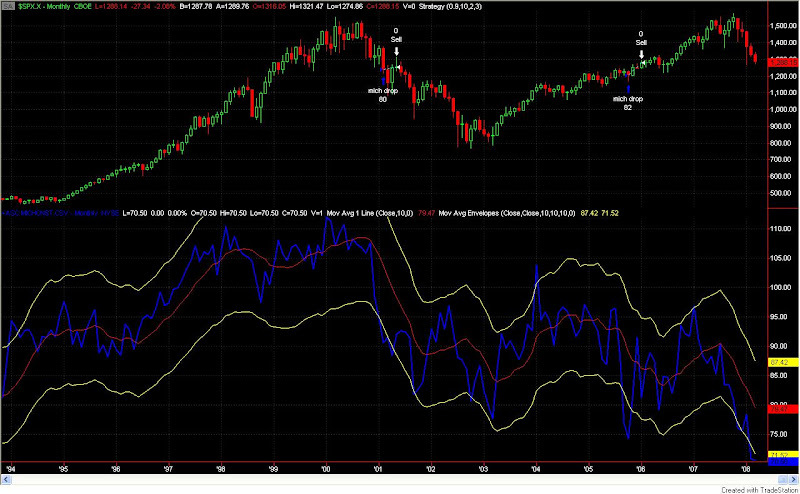 I’ve discussed this crude market timing system in the past. Since 1995 it would now have proved profitable in 18 out of 18 trades – most of which occurred during “scary” selloffs. For those interested in tracking the trades behind the CBI real time, they are provided to subscribers in the Quantifiable Edges Subscriber Letter. Also in the Letter is CBI percentages of 24 different market sectors. I looked at a lot of studies in the past week or so and they’ve all said pretty much the same thing: the edge was to the long side. Over the last two trading days the market has shot up impressively. I am now seeing some short-term indications that it is due for a pullback or at least a rest. Let’s look at two quick examples – one price based and one sentiment based. 2) The S&P rose at least 1.5% the last two days in a row. Based on the price action it appears a pullback is likely to begin soon. A modest edge is apparent to the downside after day 2. 2) The VXO closed at least 10% below its 10-day moving average. Shorting the market under these conditions and covering when the VXO closed back above its 10-day moving average would have produced the following results since 1987. 51 total trades. 31 (61%) winners. Average winning trade = 2.2%. Average losing trade = 2.6%. Expected value = 0.3% per trade. Profit factor = 1.3. Not an overwhelming downside edge here, but more evidence that continued upside may not be in the making. Based on price and sentiment measures, a pullback beginning in the next few days seems to be a likely scenario. I'm taking some time off from writing this weekend. I'll be back tomrrow night with some thoughts. In the meantime, I've added 3 new links to my relatively small blogroll. 1)bzbtrader - Much of the focus on this blog has to do with short-term QQQQ trading. 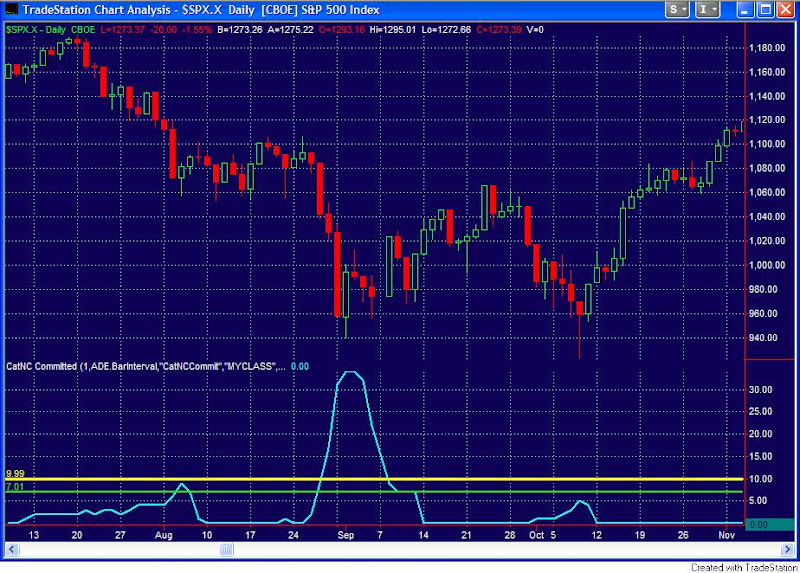 His "Weekly Updates" provide a nice overview of the market with some interesting indicators. 2) Chart Swing Trader - Market analysis with an IBD tilt. What I most enjoy about Chart Swing Trader is that he posts many charts and individual stock ideas. Few bloggers seem as willing to share their watchlists as extensively as Chart Swing Trader. 3) IBDIndex - A blog not even a month old, the IBD Index takes a quantitative look at the IBD 100 Index. 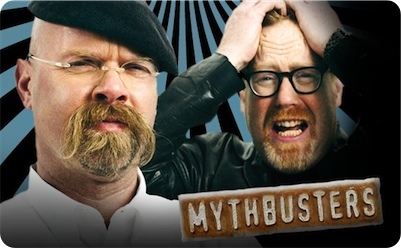 Complete with backtesting of IBD style trading ideas this blog has a few gems already. I'm looking forward to seeing results of the "Future Testing Ideas" listed on this site as well. Last week I looked at explosive moves off bottoms. Today’s was quite similar. I ran a test similar to last week to see how the market has acted under the following circumstances: 1) The S&P 500 made a 100-day low yesterday. (Last week I looked at closing lows. This week it was intraday lows.) 2) Today the S&P rose at least 3.5%. I found 10 instances that met these criteria. 6 match last weeks test. Those are listed below along with my notes from last week. 7/5/02 – A disaster of a an entry. 7/24/02 – Small 1-day pullback, then rocketed higher. 10/11/02 – 2 more days up before a small one day pullback and then further move higher. The theme remains the same as last week. They have usually been followed by a pullback within the next 3 days and then a move higher. 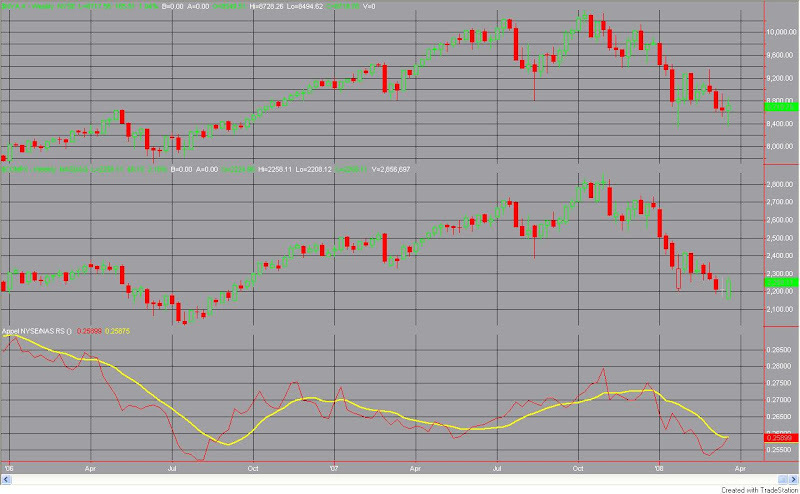 Looking out 2 weeks there appears to be a huge bullish edge. Thirteen of fifteen winners and an expected value of 3.6% over the period. Going out 90 days the average trade would have returned over 9%. The strongest edge appears in the month following the cluster. Also of note is the fact that breadth was extremely positive today. Upside volume swamped downside by more than 9:1. Last week we just missed a 90% upside day, posting 89%. While it doesn’t quite fit the criteria, I did a study in November on my old blog looking at 2 90% upside volume days within a 5-day period. Results were extremely bullish, although that instance did not work out well. In all, I’d have to say that today’s action was very bullish. Combining it with last weeks and taking into consideration such things as put/call ratios, VIX levels, etc and I’d say there is a good chance the next month or so will lead to higher prices. Will it turn into a strong bear-market rally that eventually rolls over? Don’t know. Don’t really care. What I see in front of me is quite bullish over the next several weeks. Buying pullbacks could work very well. As I discussed above, we’ll probably see lower prices at some point in the next week. Last night’s Fed study also suggested a pullback in the coming days is likely. Therefore, chasing this is likely not necessary. I’ll be ready to add to my positions if it does pull back. The large gap up this morning is quite unusual on the day of a Fed meeting. I ran a test back to 1983 to find other times the market was significantly higher at 1:30pm Eastern time on the day of a Fed meeting. I was only able to find 3 other times where the market was up at least 1.5% by 1:30. On 8/21/84 the market tacked on another 0.04% in the afternoon. On 12/18/84 it added another 1.37%, and on 1/5/88 it lost 0.64%. Not much to say this morning. The CBI dropped to “2” yesterday, officially putting that indicator back into neural territory. I’ll post a graph of recent CBI activity in the next couple of days. I continue to believe risk/reward favors the bullish case at this point. The extreme levels of fear and bearishness I’ve noted lately in such things as put/call ratios and Investors Intelligence survey lend support to the idea of a multi-week rally. My explosion off bottoms study remains in effect and also has a strong bullish tilt. Friday would be the first day that an Investors Business Daily Follow Through Day is eligible to occur so I’ll be sure to carefully monitor price and volume action in the indices. Futures are looking to gap lower this morning. The CPI report will certainly have an effect on the tone of the opening. If futures worsen following the report then my intraday focus will once again be looking for long entries. I’d suggest traders review their own charts of those periods as well to better formulate a game plan they'll be comfortable executing. Those selloffs were incredibly scary. There was also incredible opportunity for short-term profit at those bottoms. The market is going to bounce. I believe it is going to bounce very sharply. It may sell off a significant amount price-wise before that bounce occurs. Time-wise I still believe we’re only days away from a multi-week bottom. I'm currently on the lookout for a washout day or a reversal day that could mark the low. 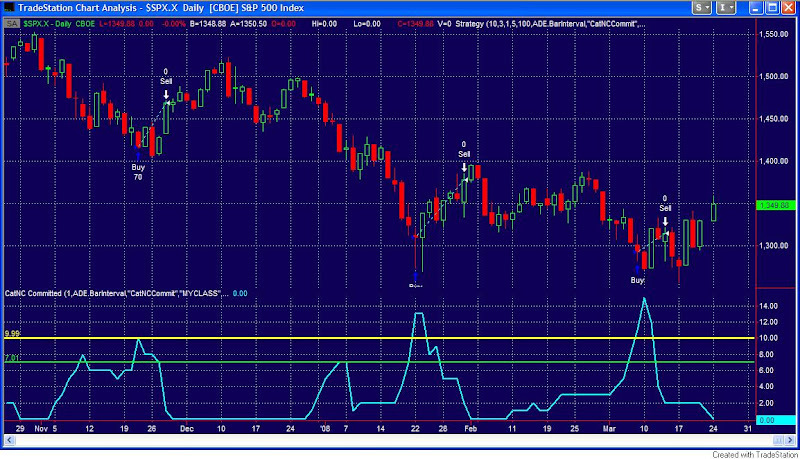 Traderfeed - An interesting study and indicator to add to your p/c charts. Daily Options Report - Some thoughtful musings on p/c related to volatility. VIX and More - A long term view of the equity p/c ratio. While I'm seeing some measures of extremes like the CBI and Put/Call Ratios above, others seem lackluster. For instance, the VIX has yet to spike sharply. Also, volume today was light. Fear is normally accompanied by volume. Tough to call it panic selling with so little participation. In summary, small dabbling may be ok, but other than my trades which comprise the CBI, I'm not getting too aggressive on the long side just yet. The above reversal bar on its own has shown a mildly bullish tendency. We'll see if the market can muster anything more than a late-day rumor-inspired pop.